We examine Thailand’s celebrated culinary culture and eclectic restaurant sector. Thais eat out often and 35 million tourists visit Thailand annually – both boons for restaurateurs, although westerners must grapple with foreign ownership restrictions and an alien regulatory environment. Eating out in Thailand is a little more expensive than preparing food at home. Allied to the 35 million tourists that visit the country each year this makes for an agreeable climate for the restaurant trade. Thai cuisine is renowned for its quality and variety and the same words can be used to describe Thailand’s restaurant trade. Welcoming huge numbers of international visitors – from tourists and backpackers to businesspeople and foreigners teaching English – Thailand has an eclectic restaurant sector with establishments serving cuisines from all corners of the globe. Thais eat out more than most nationalities. When a restaurant meal costs little more than buying ingredients to prepare food at home – about 40 baht (£1) for a cheap meal or about 200 baht (£5) per head for several dishes shared with a group – it’s no wonder. Tourists, naturally, eat out frequently too and Thailand sits 10th on the international league table of countries by tourist numbers. So there’s huge demand for restaurants and it’s served by a vibrant, diverse sector. 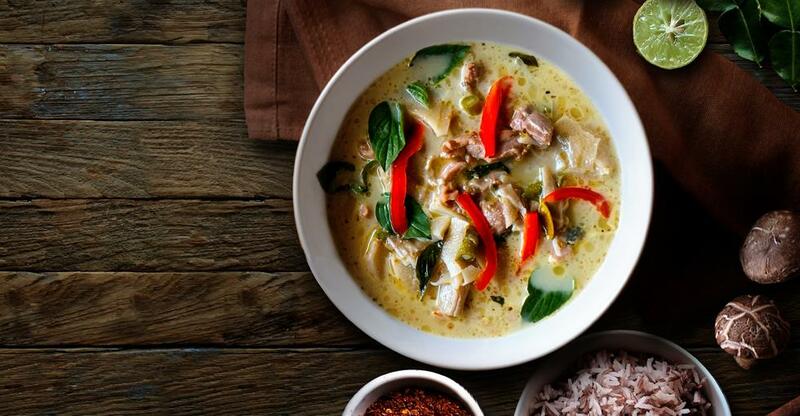 From spicy soups to coconut-milk-based curries, few cuisines boast such breadth of choice. There’s regional variation too, with food typically spicier and involving more fish in the south. The country excels at both ends of the spectrum in terms of price: with Bangkok boasting 17 Michelin-starred establishments and street vendors selling food of comparable quality to mid-tier restaurants at incredibly low prices. In smaller towns and rural areas quality remains high and competition fierce. Quality is more variable and prices higher in tourist hubs like Pattaya, Phuket and popular islands on both coasts, as restaurateurs ‘dumb down’ to Western tastes and wallets. And if tourist hotspots are more lucrative takings-wise, then businesses in these areas tend to have higher asking prices and lease costs too. Whether you want a pizzeria or a specialist in Thai cuisine, you should be able to find restaurants for sale in Thailand that fit your criteria – plus a market of discerning food lovers open to all flavours. Is a restaurant in Thailand really for you? The restaurant trade is a challenging one wherever you are in the world. It’s more difficult still if you’re running a business in a country whose language, customs and regulations are – if you’re a westerner – as alien as Thailand’s. Restrictions on foreign ownership create an additional headache – more on that later. Experience in the trade – or at least the wider hospitality sector – should be allied with in-depth research of the Thai hospitality sector, related licensing and regulatory requirements, and business law. Restaurants obviously involve long, unsocial hours spanning weekdays and weekends and Thailand is no different. Thais in the hospitality sector are accustomed to working long hours with few days off. Cafes for sale might offer less demanding opening hours though there are often few significant differences between cafes and restaurants. Restaurants for sale in Thailand on BusinessesForSale.com currently range in price from just £8,000 (US$10,700) for a 24-cover establishment in Karon, Phuket to £2.1 million (US$2.8 million) for an eatery in Sukhumvit, Bangkok. But the latter, enormous price tag is an outlier. More typically, restaurants are on the market for tens of thousands of pounds. There are plenty priced in six figures too, but even then they frequently come as part of a hotel, guest house or resort. But restaurants that also provide accommodation are not always so expensive. For instance, one Pattaya guesthouse with bar-restaurant is available for £46,300 (US$60,500). Being based in a tourist hotspot will make your life easier, especially if you’re a foreigner yourself. Luckily, then, most restaurants listed are found in the country’s biggest cities – Bangkok, Nonthaburi, Chang Mai – or coastal/island resorts like Phuket, Krabi, Pattaya, Koh Phangan or Koh Samui. Once you’ve found a restaurant you like, you should appoint a respected local lawyer with knowledge of Thai law and business regulations and experience of overseeing transactions in the hospitality sector. They can help you conduct negotiations plus obtain and vet relevant paperwork. Three-quarters of Thais say they use electronic payments, which makes the sales ledgers of many restaurants for sale a relatively useful way of gauging profitability. That said, you should visit a restaurant on sale midweek and at weekends to see if it’s as busy as financial documents suggest. It also gives you a chance to uncover any problems with fixtures and fittings, service and food standards that might prompt you to revise your offer or walk away altogether. If you’re buying a restaurant in a popular tourist area you should ideally visit in low season as well as high season. Check out other restaurants in the neighbourhood to gauge the standard of competition. You could also talk to neighbouring businesses about the frequency of flooding, power cuts and water cuts. One Thailand-based broker recommends having the sale contract drawn up by your own lawyer, rather than the seller’s, and requesting evidence that all bills are settled and that the business and its contents are owned by the seller. Whether leases are month by month or annual – and the latter is becoming more common – they can rise sharply when they expire, so annual leases are obviously preferable. You will probably need to pay 'key money', a payment for keys to the premises, in addition to the lease. The aforementioned broker also recommends establishing the terms of the key money, which is sometimes due again when the lease is renewed, and obtaining a signed receipt. Restaurants in the right location can make a killing. The arrival to Thailand of 35 million tourists annually helps. So too does the fact that not only do Thais visit restaurants frequently, they often order a couple of dishes per head plus drinks. But if you’re catering mainly to tourists then be aware that trade drops sharply during low season, between April and November. Anticipate your cash flow requirements with this in mind. Visit local competitors and assess their menu, pricing, decor and service standards, as well as how busy they are. Your findings should give you some ideas about how to improve your own operation – and pitfalls to avoid. Service standards are as paramount in Thailand as elsewhere – but not necessarily with the same priorities. They don’t regiment meals into starters and mains. Similar to Spanish tapas – but with bigger portions – they prefer instead to order numerous dishes and don’t expect them to arrive simultaneously or in any particular order. Being friendly and attentive certainly is important in a country with the nickname ‘Land of Smiles’, so recruit waiting staff with this in mind. Restaurants in Thailand, like its bars, hotels and shops, often seem overstaffed. This is one quirk of Thai business culture you don’t need to emulate if you’re to maximise profit margins.